Guest Blogging has many benefits including guest posting for networking and exposure to guest blogging for greater reach to geo-targeted blog outreach. When you want to guest post, it is critical to include a few simple things in your guest posting requests. Two or three examples of posts you’re written – ideally on topics related to the one you’re pitching – any writing if you don’t have some specific to that niche. A few title or suggested topics for your guest post. Any sites you wish to link to in your post or author box. I do not mean every link you might use. I mean your blog, specific site or social network where the blog owner can quickly see what you’re about plus any business site or blog you are creating content for or promoting. Your Twitter username and links to the social network you use most. Reading the guest posting guidelines for that site. Some have them in a separate tab (tabs are located under the header where the name of the blog appears) and others put that information on their about or contact tabs. Mine is under Guest Posts on my Contact Page. Being familiar with the blog’s content. At least skim the recent posts or categories. Even better, read and comment in a few posts so the blogger already knows who you are BEFORE you pitch your guest post ideas. Granting you contributor access so you can enter the post yourself. Be aware that once you submit it in most cases you CAN NOT make corrections so be sure to proof it BEFORE you submit. Giving you author access so you can create your post, control formatting, add images (on some blogs – on others you can’t and would have to submit them some other way – see the individual blog for how), and links with mouseover text (if allowed) and edit your post yourself. This is my preferred method here. Writing your post into a proprietary system. This are often challenging to work with and a major reason why even though I have been approved to write for a site they are far less likely to get a guest post from me. Social Media Today’s system is a good example of one that is not intuitive, time-consuming to navigate, and could easily lead to poor quality results. I would love to write for that site, but that system is a major roadblock. If you are going to require guest bloggers to use your system, make it as close to WordPress as possible and provide excellent help and FAQs. I have too many questions about how the system @SocialMedia2day works to be comfortable using it – and am too busy to want to invest time in sorting it out – at least for now. Emailing your post. The blog needs to specify what format they want the post in and how to handle links and images. Some want you to send them as attachments while other blogs forbid attachments which makes including images problematic. When a guest poster does not know WordPress I ask that they send me their post in .html version and also in .txt and/or .doc (Word) because pasting them into WordPress often creates formatting issues that can be very time-consuming to resolve. You will want to create a page for your guest posts. I still need to do that myself. An example of someone who does this very well is Kristi Hines @Kikolani. She writes so many guest posts that she now has them in guest blogging categories on her archive page. Does Your Business Style Connect or Make People Cringe? You may be wondering about the image to the left. 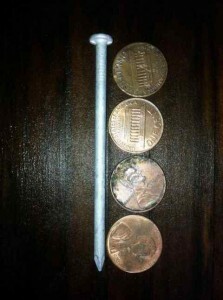 That is a Ten Penny nail next to four pennies. I share it here to illustrate how big one is – and that is central to the story I share in my post on Liz’ blog. YOUR USP – Your Unique Selling Proposition. Why You Must Differentiate or Die! That applies to every small business, every blogger and every consultant. Make a name for yourself in something SPECIFIC – not just social media, or blogging, or whatever your business does. Why should I recommend YOU over everyone else? “Big G intentionally created these problems with their MFA (made for AdSense) offering that I explained in my post about Google Killing the AdWords Golden Goose and their official Google AdSense© for Domains offering that pays big bucks to people who have littered the Internet with parked domains full of canned ads. Another “groan-inducing defense” that is getting old is the company that creates the problem claiming they are “fighting” the problem. Oh please. If you have a business, blog or existing mailing list I hope you’re paying attention to the speed with which the time spent Social Networking is increasing. Adotas quoted Nielsen stats earlier this month showing Social Networking accounts for almost 25% of all time Americans spend online. That time online means opportunities for the wise, but investing your time or money in advertising or Social Media to attract visitors to your site before having a strong system in place to enable you to capture those new visitors for your mailing list is a waste of your money. The best way to assure a positive ROI from all of your online marketing methods is to first capture and then effectively market to your in-house, highly targeted mailing list. Your first priority is to select the best list management and email newsletter software for your business. Because changing solutions can cause you to lose subscribers and learning to use any new tool takes time, you must choose wisely. The number one criterion when deciding is deliverability rate. If what you send to your list does not get through because of spam filtering where is the benefit to you? QUESTION: Does anyone have an autoresponder set up to send those interested in guest blogging their guest blogging guidelines and submission instructions? That would be very useful. If you do, please tell us about it in the comments and I will include your tips and a link with your desired anchor text to your chosen landing page in this post. Guest Blogging Invitation ~ Hiring Writers? Ask Me! Thanks for sharing guest posting tips. Guest blogging done within Google’s guidelines is very good way to increase traffic on your own blogs. I also stared my new Guest blog post which is based on different niche such as Travel, business, Technology and many more. My name is Eric Wall and I’m a Digital Marketing Expert and full-time Ghost writer. I’m a big fan of Growmap, I think it’s spectacular! Lately I’ve been focused on starting my own personal brand, and I was wondering if you’d be open to allowing me to contribute a guest post on your site. Please let me know your thoughts, as I can get started on this as soon as possible! I’d be happy to publish your guest post. The best way to reach me is by sending me a connection request on Skype (Username growmap). Guest blogging is really an effective and working way to improve blog’s or website’s traffic. I personally love guest blogging because guest blogging helps me a lot to improve my SE ranking very fast. Thank you dear Gail Gardner for sharing this article with us. After so much of repetitive tips at last I found something unique and worthwhile. At least I can use them to implement instantly on the new techniques. Others information providers should learn and be motivated to be share info as such yours. You should consider guest posting as your only outlet for new content once your blog hits a certain number of posts. If you don’t have any traffic you are writing for a vacum. Once you get 50 or 60 decent posts on your site start only pitching for guest post opportunities. It’s harder work, sure, but you’re going to see both a bump in traffic from the site and eventually an overall bump due to the backlinks. Joe C would love you to read ..Win a Free Website Checkup! In our Social Media-driven online community we definitely need to build relationships to succeed and continue to grow our presence! Thanks for the awesome tips here, and I will apply them to my own guest posting efforts. Keep up the great posts! best ever tips for guest blogging. Growmap please change the name from Guest Posting: Guest Blogging Tips ~ My Guest Posts to a gift for guest bloggers. I have been aware of the benefits of the guest posting but have never tried it. Getting the right opportunity for guest blogging is very important. And this was the main reason why I did not take up guest blogging till now. But after reading your post you have inspired me to take a chance for it. Your tips seems very effective to help me out to earn a good opportunity for guest posting. Thanks! Thanks for the good advise. Guest posting is indeed a very effective strategy to build reputation and gain traffic. Just remember to create high quality content so that readers are interested in reading the article. Great tips. I have found that when I set out to get guest posts, I will let them know about the past guest posts that I have written, BUT the kicker is that I will link to my best. For example, I’ve been featured on a few predominantly well-known publications. When people see this, they instantly deem you to have some sort of credibility. cool tips for guest posting, I am planning to do some guest post but my blog isn’t ready yet. Thanks for the tips! Guest posting is an intergral part of blogging phenomenon.Apart from getting backlinks and traffic,it shapes your identity among bloggers and create a connection with them. Write guest posts on the content related to the niche of that blog and always come up with new stuffs and tips. Yah guest posting is really beneficial for bloggers.it a great way of networking. Guest posting submission tips which you have shared are very good. By getting author access is the best way to submit the posts. This way one can submit the posts after making desired changes or add ons. Also I think one should comment more than once on the site on which one is looking forward to do guest blogging. This will the make the blogger to know the guest blogger before posting guest blog. This will increase the chances of getting the opportunity for guest blogging. I have been guest blogging for quite some time, but I do appreciate your tips. Sometimes I find that some bloggers are very receptive to letting someone else submit content while others are not receptive at all. I think including past work, telling what you will do and giving some information about yourself are all helpful in at least giving the other person a reason to let you guest blog. It shows a degree of credibility that you are not simply looking to put anything up on their blog (crappy content) for a link or some other benefit. The post was in deed for me. I am not guest blogging from a long time and the post kicked and remind me of guest blogging. That’s wonderful. My guest post usually refuse by Admin. I do not know the reason. When English is not a blogger’s native language they need to partner with someone who can edit their writing. Most blogs will not take the time to try to edit what you submit and many times without interacting with you it is not possible to even determine what was intended. I get a LOT of complaints because I approve comments that are sometimes difficult to understand because the person writing them is using machine translation or struggles with expressing themselves in English. Many judge harshly those whose English is not as good as their own – even when THEIR OWN English leaves a lot to be desired. We can only see errors we recognize so many Americans whose grammar and spelling are very bad and who use the wrong versions of words do not understand that they are condemning themselves as well as others when they promote the idea that a “quality” site should delete all imperfect comments. As someone who has studied a foreign language and was once fluent in German I know how poor machine translations are. As someone who regularly interacts with many bloggers whose native language is not English, I also know that I can often not tell what they mean until repeated clarifications. But I also know that they have important ideas and expertise to contribute that make it worth taking the time to bridge that communication gap. I encourage bloggers to seriously consider writing for the native speakers of their own language. They would be just as interested in what you have to say as the rest of the world and can more easily understand you in your own language. The tips which you have listed out here seems effective. I have never approached any site with such a guest post request. I have been trying to do guest posting for quite sometime now but have never yet received any single opportunity. But I think now after following your tips I will be able to get the right opportunities. Thanks! Guest posting is a great example of how the blogging community provides a support system. By working together and promoting each other we all learn more and earn more. I completely agree with you that guest blogging has many benefits. It helps in befriending other bloggers and also helps in networking. Networking is very essential for any online business. I do it to direct the traffic from other sites to my site. But I get very few opportunities for guest posting and I am not satisfied with it. Thanks for your useful tips! Will surely try them. Thanks for the tips, its truly helpful especially when you’re doing guest posting which is currently vital since fresher content is important not only to the search engines but also to the readers. And it must be a compelling one also. Guest posting is an ideal way of networking. It builds more back links that help promote your site to the readers and clients as well. Keep posted! I think you should approach the bloggers directly. You’ll get higher quality content by doing that and less time will be wasted by sorting through them. Guest posting is a great way of communicating with people whom you share the same interests and it is a great opportunity to build a good relationship with them. Guest posting will help in getting the desired exposure among the bloggers in the blogging industry. It gives me immense pleasure as I get to befriend with many other bloggers. This is very essential in my business and helps in better networking. But to get an opportunity to guest post is a tough job. But I think the tips which you have listed here are spot on. One can surely get an opportunity to guest post if he/she follows these tips. I think the tips which you have mentioned to include in guest blogging request are very good. I have never tried including such things. One will surely give a chance after reading such request. Also by looking at your guest posts I think you have nailed in this field. The topics which you have taken up for guest posting are interesting too. I think topics also play vital role in guest blogging. I haven’t actually done guest posting yet but I am planning to approach some sites soon. That’s the reason why I landed in your sites. I was looking for tips on how to guest post. Thanks! I learned a lot, just from reading this post. To be honest – I have neglected doing any guest posts 🙂 Time is becoming extremely tight to even post to my own blog. Yes, we all have that issue and need to decide where the most important places are to invest our time. I hope more bloggers are giving that much thought rather than just spreading themselves thin. Guest blogging is a good way to get readers and backlinks for your site. But make sure to regularly update your posts, this may help you to hold your visitors on your site. Guest posting is in trend. I think guest posting is replacing article marketing. Site owner prefer getting links from a blog rather than an article directory. you wrote some great points here. thank you so much. I have been searching for guest blogging opportunities but find it really hard to find good blogs / websites that accept guest blogs. I have been seeking blogs that already offer guest blogging spots – for some reason I never thought to search for the good blogs first then ask! Thanks for making the obvious a little more obvious. You can’t always tell by looking at a blog. Some bloggers don’t have any information up on how to guest post for them and even though I do I get a lot of inquiries via my contact form that miss mine – even though the info is ON the same page as the contact form. The easiest way to have a blogger want your guest posts is to be a regular commenter – and that works especially well in CommentLuv enabled blogs because they (and everyone else) can instantly see what you blog about. If you’re a regular commenter who leaves great comments and has quality content on the blog you link to, even a blogger that rarely publishes guest posts is likely to want to publish one for you. I encourage bloggers to guest post on sites that already reach YOUR audience so you know their readers would be interested and you multiply both your audiences – because when your guest post is published you are going to write a post on your own blog sending YOUR readers to THEIR blog to read it! I also encourage bloggers to use my five blog guest blogging schedule for maximum benefit. In it, 5 related blogs guest post once a month for each other so that you consistently remind all your readers of the other blogs in your collaboration. This maximizes the SEO benefits, too. For more tips on collaborating and to find out how your group can get free mentoring from me see Blogging Collaborations and Best Practices>. This post differed from others I had viewed previously, in that it gave us a glimpse at guest blogging from the receiving side. This helped me to get a good understanding of what kind of posts work, and what mistakes I should avoid. Just like one needs to learn about a company before going to a job interview; one should learn about what a blog’s primary focus is, and who is the force behind the blog before one submits guest posts. If you want to have any chance at convincing another blogger to publish your guest post on his or her blog, then it’s absolutely imperative that you take some time to get to know the other blogger, the content of his or her blog and the audience for that blog. Take some time to read through the blog’s current content and archives. Read through the comments and get a feel for what content is acceptable and popular on that blog. Then submit a guest post idea that is relevant and fills a gap in the existing content. Useful hints and I am certain that I can use this information especially on my campaign promoting aquarius tattoo designs and other artistic matters. Guest posting is one of the most powerful technique I have ever been through in link building and social marketing. Thanks for such an interesting post on same topics. Guest blogging can pay huge dividends not only from the SEO benefit but from acquiring new readership through exposure to a huge audience that the guest blogger would normally not have. Great tips. One thing that is often overlooked by Guest Authors is ensuring you visit the site a week after publication to reply to comments and engage the blogs readership. Great way to get invited back. You’re right robin, we don’t want to miss the chance to be engage in readers and possibly know people who could help you in the future. Guest posting is a good opportunity to get links but above all it’s an opportunity to build relationship to people in you niche. Good explain about guest blogging.Guest blogging is a great way to get traffic.Thanks for nice article. Nice post, guest posting is indeed a great way to earn exposure for young (and less young) blogs. I have an article I almost finished, and I’m thinking about submitting it to you! i guess this is really helpful and also wonderful. we must be very carefull about seo though. Guest blogging as being mentioned provides various benefits to a blogger, besides of getting greater exposure, building high quality backlinks it also open great opportunity to show its craftsmanship in writing topics. Those cited tips are helpful for those aspiring guest blogger who wanted to engage in guest blogging. Well-done post! Great post! Although i’d like to add that in order to be able to really open the door with another blogger, you need to have a rapport with them. In my experience, a lot of bloggers are very protective of the content that goes on to their blog, so they must trust you and prequalify you BEFORE you submit an article to them. Another thing, guest posting is really powerful for branding yourself, yes, but it’s also really powerful for generating income. I actually have a $10 product that’s all about guest blogging. And yes, I also have a mailchimp autoresponder that sends interested folks to my guest blogging guidelines and submission instructions. I think it’s easy to do if you’re familiar with mailchimp. again, great job. and I may even hit you up for guest posting opportunities. As one of the previous comments mentioned I don’t thin k it hurts to write a nearly finished blog post for another blog you would like to guest blog for and send it. It shows commitment and it is simple for the blog owner to post it up straight away. Why is everybody so crazy about guest blogging and PR after all there are a number of blogger I know that have never written a single guest post and have PR 0 and still they rank so well in Google search result. If you ask me guest blogging is the most effective way to get targeted audience to your blog as well as gain quality backlinks. I know it’s a lot of effort, that possibly can be good for nothing, but I made the best experiences, when I sent the almost completed blog post to the blog owner. A little “blitzkrieg” tactics 😉 But then the owner knows immediately, whether it’s worth to put your post online or not. It’s risky, but I had the best results this way. 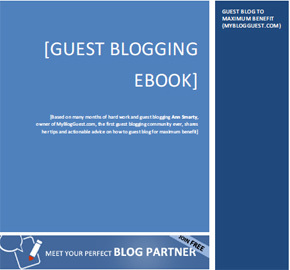 Guest blogging is the good way to generate traffic and build high-quality-backlink for all blog. But, unfortunate, not all blogger, however, knowing how to use it on the right way. Thanks for your great guest blogging tips. Very interesting Gail, guest posting is something I haven’t done yet as for now I’m focusing on other things like better keywords, a better style of writing and commenting on other blogs :), but this is surely a good guide about how to do guest post the right way. Thank you for these guest blogging tips. I really intend to start doing it in the next month when everything in my website is set up. Great post for sure. I use Guest Blogging for SEO-developing of my own sites and blogs. I think sharing your posts is really nice. Guest posts always leave people feeling jittery about what they should and should not do. I feel in the entire process people end up feeling confused about what and how they should write. In times like these reading guest posts written by others can be inspirational and that is exactly what yours has turned out to be.Thanks. A cleverly made post. I like the way you have covered all bases. This will definitely be a big help for those who want to do guest blogging. Your post is extremely well timed. I must confess that I had a few doubts about when and what should be done about the guest blog comments. I am new to the entire blogging world and am at a loss of sorts about what I need to do as a blogger. I was first acquainted to this world by my brother who did a few guest blogs and asked me to also start doing some. i have two opportunities and I must say your post has helped my jitters settle. Guest posting is one of the most effective ways for us to build some traffic to our blogs. Although this may not be the best way to drive some traffic, but it does help at least. SEO is still the grand daddy of targeted and long-term traffic.